Description: A masterpiece of sonic excellence, the Shanling CD 300 offers a stunningly outstanding musical portrait in an elegant and classy design. It is a true dual mono design with separate power supplies, upsampler, DAC and output buffers for each channel. The result is a warm, rich, and detailed soundstage with subtlety and finesse. 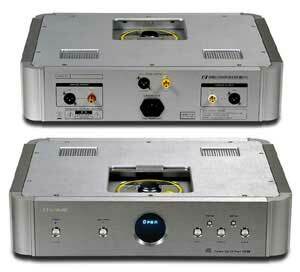 I was due for a new CD player and deided to compare the Cambridge Azur 840 and the Shanling CD300. I borrowed both from different Audio stores and on the advice of the Cambridge dealer let it burn in for 2 days. I first listened to the Azur extensivly to get familiar with the “sound”. I then compared it to my set up ( Phillips 963 SE w/ MSB Link Dac “Full Nelson” edition w/MSB out board power supply). The Azur did not sound any better or different than my Phillips set up. I was some what taken aback at this after hearing all the hipe in the audio rags ” equals the sound of $5000 dollar CD players etc.”. Then I set up the Shanling, same cables etc. and could not believe how much better it sounded than the Cambridge! Bigger sound stage, more open sounding, more well defined bass and smoother. The Azur sounded more “Hi-Fi”, the Shanling much more real. With upsampling set to 24/192 it was no contest ( the Azur upsamples to 24/384 if memory serves corrrect and that’s how I auditioned it). I am a professional muscian and am very in tune with “live” music, jazz and fusion to name a few. With the Shanling cymbals sound like the real thing, on the Barber CD referred in the previuos review the upright bass has lots of wood in the sound, the drums very real sounding and Patricia’s vocals and keyboards exceptional! I believe the 300 with its tubed output stage and balanced outs (for an intermediate priced player)is definately worth a listen! I bought this player “new”, not from a grey market source and have owened it for almost 2 years now and no problems!. My system consists of: MG 1.6QR’s, Cary SLP-308 Pre-amp, highly modified Hafler DH-220 ( aka Musical concepts P3-C boards, Black Gate caps, torodial transformer and Cardas binding posts). Speaker cables: Paul Speltz ” Anti-Cables, Kimber “Silver-Streak” inter-connects, Shyunata Taipa and Kimber Power Cords and Monster HTS-1000 power conditioner. The description as written for the CD300 is absolutely true. The Shanling CD-300 is highly recommended! Top Ranked Products from Shanling. AudioREVIEW works best with your help. Write a review for others.Â It might be a highlight! I love the sound of mine, but the front buttons feel VERY cheap and are very loosely goosey. The sound is very musical, playful. The top tray collects dust, when you open it it delivers said dust to the interior. I vacuum mine, gently of course about twice yearly. That’s a practical point that only manifest after a year or two heavy use. It has tube-y vocals but bass more like solid state. As always enjoyed the review thanks.